Slice beef into thin pieces across the grain and set aside. Dice raw bacon and add to a hot, 2 qt. pan and brown. Meanwhile, place the tomatillos, garlic and Serrano chilies in a saucepan with the chicken stock and bring to a boil. Reduce to a low simmer and cover cooking for about 10 minutes. When the bacon has been rendered, add the steak to the pan with bacon and fat, searing well. Put all the ingredients from the saucepan into the blender and blend until smooth. 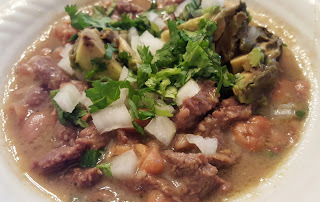 Pour the tomatillo mixture over the beef and lower heat to simmer slowly for about 2 hours. Add the pinto beans and continue to simmer until heated through. Taste and season as needed. Serve with cilantro, diced avocado, onions and lime wedges. *Lesser cuts of beef like a chuck will benefit from long simmering.